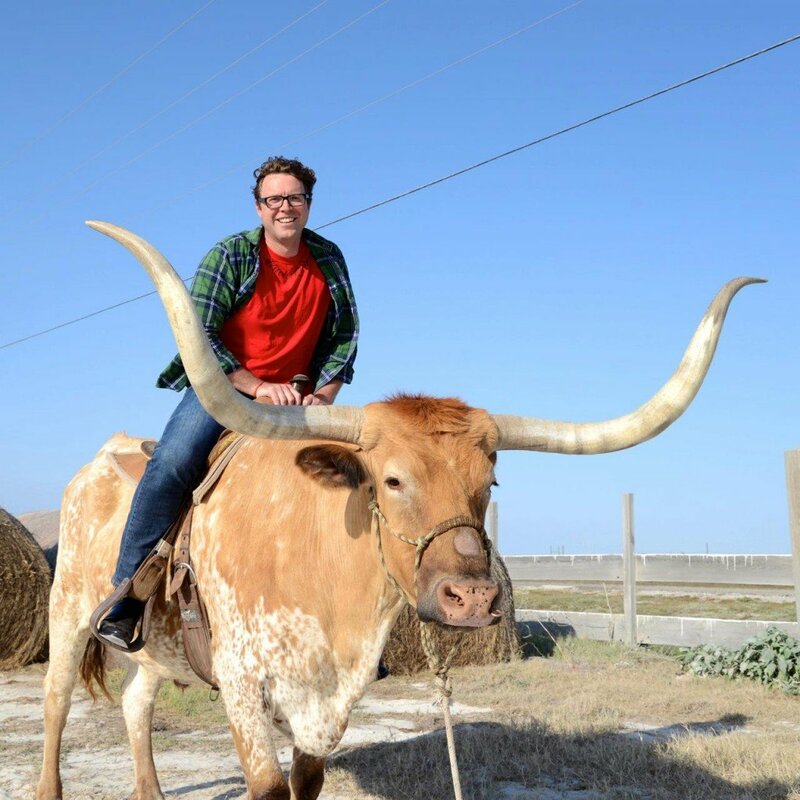 Digital Nomad Andrew Evans astride a Longhorn during his tour of Texas. If you love travel and social media, then the one person you should be sure to follow is Andrew Evans (@wheresandrew on Twitter). Andrew is currently National Geographic Traveler’s Digital Nomad, a job that takes him all over the globe, where he sends verbal and visual dispatches via Twitter and his blog. I can think of no other travel writer working today who so consistently provides context about a place with such kindness, professionalism, and wonder. Thus, I’m really honored that Andrew took a little time to tell me more about his media diet and his typical working day. If you are still curious about Andrew’s work after reading this, I suggest taking a look at his TEDx talk How to Achieve Your One Travel Dream. In this 15-minute video, he explains how he set in motion his Bus Trip to Antarctica, the epic travel project that landed him a full-time gig with Traveler. How do you start your typical writing day? I’m an early riser and an early writer, meaning, left to my own devices, I’m up at 5 AM and writing away. I do my best work in the morning and then slowly deteriorate until mid-afternoon, when I’m generally useless. I don’t really read anything when I wake up, unless you count Twitter, which I check from bed—I read every single comment from every single reader. How long have you been working at National Geographic Traveler as the Digital Nomad? Three years, as Digital Nomad. Do you write a lot while on the road or wait to write later using the notes and photos that you’ve taken? I write every day on the road—I try to keep my blog as close to present-tense as possible. For articles or books, I wait until later. On the road, I carry a 100-page notebook in my pocket for writing down impressions, emotions, adjectives, names, and details of people I meet and quotes that I hear—basically anything I want to remember. I put a sticker on the front of each notebook—usually the flag of the place I’m in. I have a whole box of these at home, but with the flags, I can sift through them quickly and check old notes. For some stories, I might go back to notes from years ago. I am most inspired by people I meet when I’m traveling. Local personal stories are always the best inspiration. Are there certain columns or writers that you aim to read each day, week, month? I do read Christopher Elliott. I also love Amy Tan on Facebook, Anne Lamott is one of my favorite writers on Twitter, and I follow her and her son, Sam. On Twitter, I always love the musings of @NerdsEyeView [see interview] and the erudite @ReidOnTravel [interview]. In house at National Geographic, I’m a huge fan of Ted Chamberlain (@ted_chamberlain) and Marilyn Terrell (@Marilyn_Res). I also read all the stuff my followers are tweeting—they are all pretty interesting people. You’re very active on Twitter. Are there other social media services that you are active on? I am very active on Twitter—when I’m traveling. When I’m home I tend to take a break and clam up. I think Twitter is an amazing thing—in moderation. I also have a Facebook page and I’m dabbling in Tumblr and Google +. Since your title is “Digital Nomad,” how much of your day is spent on social media? When I’m in the field, I’m on social media constantly. I don’t even see it that way though—I just see it as a way for me to travel with all of my friends in tow. Last month I read Let’s Explore Diabetes With Owls by David Sedaris. He’s always classified as a humorist and essayist. In my opinion, his latest book definitely counts as travel writing. Like me, he’s on the road all the time, and so his life is filled with observations about different places and the limbo of modern travel. I really loved reading it and especially loved his sense of place. Yesterday, on the plane, I read the original “Tarzan of the Apes” by Edgar Rice Burroughs [free download] which is delightful. It’s a kind of naïve fictional travel writing from someone who had never been to Africa, but wanted to imagine it. It also (perhaps unwittingly) lays out the classic conundrum explored by most travel narrative—the dance between the civilized world of home versus the strange, new, and wonderful foreign world that lures us into the jungle. You’ve been writing a while. What are some pieces that you are particularly proud of? Thank you! I like writing about the way a place makes me feel, or capturing certain moments, like New Year’s Eve in Scotland. I also like exploring places that others might disregard, like I did in Butte, Montana or how strange and weird certain moments on the road can be. I remember once writing a piece about being home that was important for me, because sometimes I feel like I’m still traveling, even when I’m home. I am a cult follower of “This American Life” on NPR, and I always download The Moth. Both are contemporary storytelling at its best. Is there any particular music that gets you through your writing and/or travel day? When I’m writing, I can’t listen to music with words, so I listen to classical (Rachmoninoff and Satie are favorites) or post-rock instrumental (My favorite bands? This Will Destroy You and For a Minor Reflection .). When I’m traveling, I tend not to listen to music because I don’t like blocking out the world with headphones—it’s a sign that you are closing yourself off from other people, and when I’m traveling I want to be open to others. Even though I’m a digital writer, I am very much an analog reader. I like it old school—and love to read old books about places. I will often read old guidebooks from a century ago, just to get a sense of what it used to be like. I love to read history books about places, especially rare and out of print, which I can normally track down on Google Books. I do read Wikipedia—not as a source, but to find out how well-known something is and steer clear of the generally-known stuff so that I can make sure I am adding something different. For example, in my most recent trip to Montana, I read the unabridged (original text) of The Definitive Journals of Lewis & Clark. It’s several volumes, so I just focused on the same geographical areas that I was in. When I’m in a place, I also like going to local libraries and sifting through their local interest selections. They are always fascinating and I can count on finding good stuff there. Anything else you’d like to add — anecdotes, tips for finding news sources, writing or research advice, etc.? I don’t think that there’s any one right way or even best way to do this kind of work. I think you have to discover what works best for you, and that is going to be something very individual. I do know that when I am in the mood to write—then everything else stops until I am finished—or else that mood has passed. I know from experience to pay attention to that feeling and to follow it. Likewise, you can’t force it—so if something is not working, I know better than to waste my time, and I’ll leave it and go do something else until I can come back to it.